On Thursday, I crossed a Boston food experience off my to-do list. Clover Food Lab has five trucks in Boston and Cambridge and I went in search of the Government Center truck. It's tucked to the right of City Hall between two Asian food trucks: a little foodie enclave in an unlikely location. The Government Center and State Street areas are tricky for lunch and, having had more than my share of Midtown Manhattan deli salads, I was delighted to steer clear of the sandwich-and-salad shops and to order the $5 chickpea fritter sandwich instead. 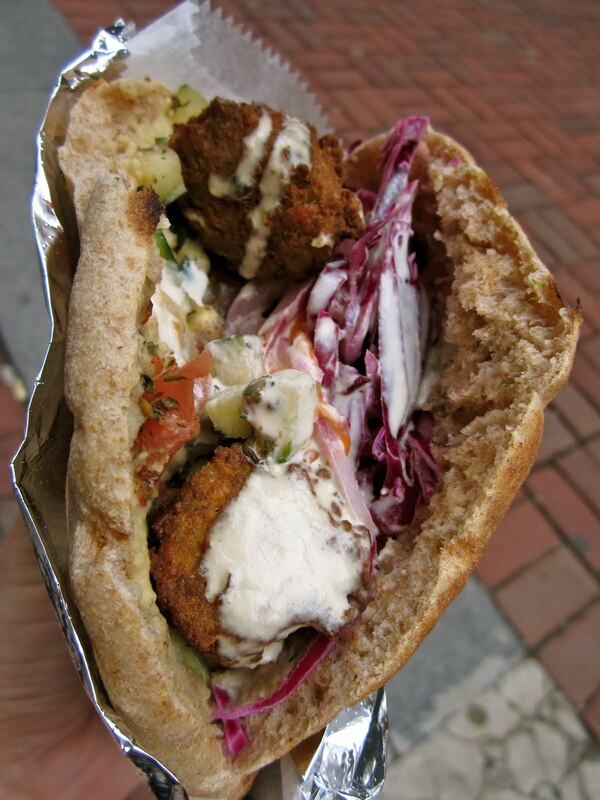 It's a fresh, colorful sandwich: chickpea fritters (lighter and smaller than your usual falafel), carrots, tomatoes, cucumber, onion, shredded cabbage, hummus, and yogurt stuffed in a whole wheat pita and wrapped in tinfoil. All together delicious and, since I arrived just after the lunch service began, the fritters were also made-to-order. As I sat on a bench near the Old State House, a woman wrapped up in a long, black raincoat stopped, eyes wide, to ask me where I got the sandwich. Between bites, I pointed around the corner. So, a heartfelt thank you to Clover. Thank you for saving us from deli salads.